For me, Grover Cleveland presents a greatest presidential comparison challenge. His two terms in office most parallel the one term of Benjamin Harrison, but not precisely and Harrison's very tenure creates a conundrum. Seventeen of our forty-four presidents have been reelected and a handful was never elected at all because they took over for a deceased chief executive. Just one, Grover Cleveland, was in, out, and in. Cleveland served at POTUS from 1885 to 1889, lost the 1888 election to Harrison, then won back the White House and served from 1893 to 1897. This hiatus leads me to compare Grover I to Grover II. The big lesson in Cleveland's two terms is that he embodies the fact that Democrats and Republicans were in the thralls of reinvention and that Cleveland was the transitional figure. He was a Democrat, but not the sort a modern Democrat would recognize and not the sort that would cause total alarm among 19th century Republicans. The label often applied to Cleveland was Bourbon Democrat, the term a bit of wordplay referencing both the drink and the royalty line overthrown by the French Revolution. It alluded to an archaic aristocratic and conservative bearing. (Bourbon was not yet a drink of the masses!) Like Republicans, Cleveland was pro-business, though he had an incomplete grasp of the emerging dominance of industrial capitalism. He also shared both the GOP aversion to messing with the monetary system and its increasing de-emphasis on civil rights. He departed with them on the spoils system, tariffs, and imperialism. Cleveland thought the spoils system smelled and supported ongoing reforms of the civil service. He created the Interstate Commerce Commission and staffed it with professionals, though the ICC would not have real power until the Progressive Era. He did all he could to pare the size of government and reduce spending. His parsimony led to two controversial decisions. Cleveland vetoed a bill that would have given pensions to Civil War vets. He was skeptical that vets deserved any sort of pension for doing their civic duty, though he was willing to compromise over disabled veterans. This is a way in which the 19th century (and into the post-World War II period) was very different than our own: there was very little sentimentality about vets and they were not seen as voting bloc that had to be appeased. His other controversial veto was the Texas Seed bill, which would have given government bailouts to farmers hard hit by drought. Cleveland was more prone to laissez-faire notions that government should play a minimal role in economic matters. That view extended to monetary policy. The Democrats would, after Cleveland, embrace the soft money position of the free silver movement, but Cleveland embraced the gold standard. This put him at odds with farm state Democrats, especially in the South, but his views reflected the fact that he was the first Democrat of any sort to occupy the White House since James Buchanan (1857-61) and the first Northerner since Martin Van Buren (1837-41). Cleveland—a former Buffalo mayor and governor of New York–anticipated the more urban perspective of future Democrats. Cleveland mirrored the nation's weakening interest ­in civil rights. With the notable exception of native Hawaiians, Cleveland was very bad on racial justice issues. He simply didn't care all that much about African Americans, he extended the Chinese Exclusion Act after saying he found it regrettable, and took a paternalist view of Native Americans, whom he regarded a veritable children in need to government supervision. Cleveland disagreed with Republicans over the tariff, The GOP wanted higher tariffs to protect American industry, whereas Cleveland was an early proponent of free trade. Tariffs were lowered during both his administrations. Unlike Republicans, the Democrat Cleveland was anti-imperialist. He tended toward isolationism, but he also saw imperialism as a betrayal of American idealism. A lot can happen if you take four years off, which Cleveland found out after the Harrison interregnum. Historians debate the causes of the Panic of 1893 and assign a lot of the blame to Harrison's inability to make firm decisions about the economy (or anything else) but Cleveland's own hard money policies are at least partly to blame. In essence, the decision to avoid bimetallism led to a gold shortage that weakened the economy. Cleveland spent nearly all of his second term struggling to deal with a depression that lingered into early 1897 and is regarded as either the second or third worst in the nation's history. Cleveland lowered the tariff that Harrison had raised and financed it by placing a tax on incomes over $4,000 (today's equivalent of over $100,000). Neither had much impact on the depression. Worse, the depression tipped Cleveland's hand that he was unsympathetic to labor unions or social movements. Both Coxey's Army and the Pullman strike occurred during the second Cleveland administration and the use of strike injunctions and the imprisonment of Eugene Debs betrayed Cleveland's bias toward the well heeled. Although Cleveland invoked the Monroe Doctrine to warn Britain to cease its interference in a border dispute between Venezuela and British Guiana (today's Guyana), he largely stood his anti-imperialist ground. Many scholars argue–and I concur–that his finest moment was his staunch support of Queen Liliuokalani and his refusal to annex Hawaii. He remains a folk hero among some native Hawaiians. Mainly, though, bitter relations with Congress and the worsening depression marked Cleveland's second whirl in the White House. Grover Cleveland is, indirectly, the source of a famed American legend. Although many Americans think the Baby Ruth candy bar is named for baseball's Babe Ruth, the Curtiss Candy Company (now part of Nestle) claims the sugary bar was named in honor of Cleveland's daughter. That could be the folktale behind the folktale. Cleveland entered the White House as a bachelor, but married Frances Folsom in 1886. She was his junior by twenty-seven years, but the couple eventually produced five children, the first of which was Ruth (in 1891). Nice, but the Baby Ruth debuted in 1921, the year after baseball's Ruth smashed the single season homerun record. Some think that Curtiss used Cleveland's daughter as a dodge to avoid paying "The Babe" name use royalties. She, after all, died of diphtheria in 1907 and her father died the following year. Ruth, though, was one of the most popular names for newborn girls from the 1890s on. Transitional figures such as Cleveland are hard to judge; by their nature they are neither fish nor fowl. The latest rankings have Cleveland at #18, which seems too high given his mixed record. But then again, transitional figures seldom inspire passionate debate one way or another. When was the last time you heard anyone argue over Grover Cleveland? I'd argue, though, that mid to low twenties is more warranted. The Revenant could have been a lot of things: man versus nature, a study of frontier rawness, a probing of the destructiveness of greed, an exploration of geopolitical tension in the early 19th century, or musing over the question of who was more barbaric—Native Americans labeled as “savage,” or their white labelers. The Revenant does a drive-by on all of these, but it’s at heart a generic revenge film Scotch-taped to Jeremiah Johnson and Lawrence of Arabia. It is based on the real-life account of Hugh Glass (“loosely,” I would imagine), a frontiersman with reason to brood—soldiers ravaged and burned the Pawnee village where he lived with his wife (Grace Dove in a cameo) and son. His wife was shot down like a dog and his son, Hawk, badly scarred by fire. Move the clock forward to the year 1823, a confusing time in U.S. history. The Louisiana Purchase was completed 20 years earlier, but the borders between U.S. territory and British Canada in the future Dakotas and Montana—where this film purports to take place—are unknown and of little concern. French voyageurs and American traders are rivals in the fur trade and make (and break) alliances with Natives in attempts to gain the upper pelt—except for the Arikara tribe, who is at war with everyone. Glass (DiCaprio) is acting as guide and tracker for an American group headed by Captain Andrew Henry (Domhnall Gleeson) that is surprised by Arikara raiders who kill the 75% of the party that didn’t manage to escape by boat. Glass knows, however, that the survivors are on borrowed time on the Missouri River and must—over the howling protests of dissidents led by John Fitzgerald (Tom Hardy–leave the river and make their way toward Fort Kiowa on foot to escape with their scalps attached. As Glass leads the disputatious gang, disaster occurs when he is so badly mauled by a Grizzly bear that he is presumed a goner. Out of respect, though, Captain Henry asks for three volunteers to stay with him until he dies to give him a Christian burial. Naturally Hawk (Forrest Goodluck) opts to stay with his father. So too does young Jim Bridger (Will Poulter) and Fitzgerald, who wants the extra pay promised for the task. Glass, however, takes too long to “die,” so Fitzgerald decides to speed the process—only to kill Hawk who tries to intervene while Bridger is out of sight. Fitzgerald drags Hawk's body from plain view and bullies Bridger into abandoning both men. You pretty much know what will happen next, though you probably don’t expect to watch Glass endlessly grunting whilst pulling himself across the landscape covered in a bear skin. (Gee—I didn’t get the human-into-animal transference, Mr. Iñarritu. Can you make a more obvious man-in-the-state-of-nature metaphor, please?) These scenes are so interminably long that, to alter an old Hollywood joke, they make Lawrence of Arabia seem like an epic. Much more affecting scenes occur when Glass makes contact with a Pawnee man (Arthur Redcloud) who helps him. Later Glass saves an Arikara woman from voyageur ravagers and learns of the fate of his Indian savior. But all of this is prelude to the avenging Glass’s arrival at Fort Kiowa and his show down with Fitzgerald. The landscape is stunning—though most of it was shot in the Canadian Rockies, not the Dakotas or Montana. It’s not enough to compensate for a film that that glosses all that is has potential depth and doesn’t need to be 2 ½ hours long in service of one man's singular pursuit of another. Glass’s physical trials along the way are so harrowing that it’s hard to imagine any human could actually survive them. Perhaps we are to infer a magical realism quality to them, or that a dying Glass merely dreamt them—but no, we are aware that the historical Glass survived. 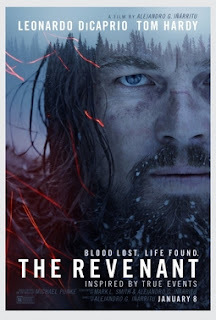 In the end, the only revenant I encountered was the specter of the lost slumber in whose arms I should have been reposing rather than wasting my evening on this overstuffed, overrated Jeremiah Johnson outtake. PS: Although the film claims to have used only robotic animals and special effects, these are very realistic. Those sensitive to animal (or human) violence should avoid this film.